(Nanowerk News) Scientists at the Carnegie Institution have found for the first time that high pressure can be used to make a unique hydrogen-storage material. The discovery paves the way for an entirely new way to approach the hydrogen-storage problem. The researchers found that the normally unreactive, noble gas xenon combines with molecular hydrogen (H2) under pressure to form a previously unknown solid with unusual bonding chemistry. The experiments are the first time these elements have been combined to form a stable compound. The discovery debuts a new family of materials, which could boost new hydrogen technologies. The paper is published in the November 22, 2009, advanced online publication of Nature Chemistry. This schematic shows the structure of the new material, Xe(H2)7. 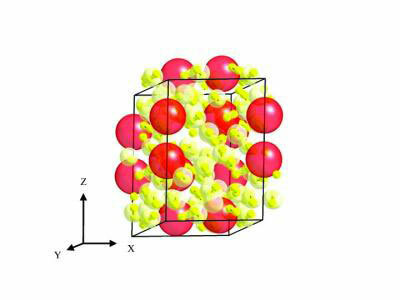 Freely rotating hydrogen molecules (red dumbbells) surround xenon atoms (yellow). Xenon has some intriguing properties, including its use as an anesthesia, its ability to preserve biological tissues, and its employment in lighting. Xenon is a noble gas, which means that it does not typically react with other elements. As lead author Maddury Somayazulu, research scientist at Carnegie's Geophysical Laboratory, explained: "Elements change their configuration when placed under pressure, sort of like passengers readjusting themselves as the elevator becomes full. We subjected a series of gas mixtures of xenon in combination with hydrogen to high pressures in a diamond anvil cell. At about 41,000 times the pressure at sea level (1 atmosphere), the atoms became arranged in a lattice structure dominated by hydrogen, but interspersed with layers of loosely bonded xenon pairs. When we increased pressure, like tuning a radio, the distances between the xenon pairs changed–the distances contracted to those observed in dense metallic xenon." The researchers imaged the compound at varying pressures using X-ray diffraction, infrared and Raman spectroscopy. When they looked at the xenon part of the structure, they realized that the interaction of xenon with the surrounding hydrogen was responsible for the unusual stability and the continuous change in xenon-xenon distances as pressure was adjusted from 41,000 to 255,000 atmospheres. Why was the compound so stable? "We were taken off guard by both the structure and stability of this material," said Przemek Dera, the lead crystallographer who looked at the changes in electron density at different pressures using single-crystal diffraction. As electron density from the xenon atoms spreads towards the surrounding hydrogen molecules, it seems to stabilize the compound and the xenon pairs. "Xenon is too heavy and expensive to be practical for use in hydrogen-storage applications," remarked Somayazulu. "But by understanding how it works in this situation, researchers can come up with lighter substitutes." "It's very exciting to come up with new hydrogen-rich compounds, not just for our interest in simple molecular systems, but because such discoveries can be the foundation for important new technologies," commented Russell Hemley, director of the Geophysical Laboratory and a co-author. "This hydrogen-rich solid represents a new pathway to forming novel hydrogen storage compounds and the new pressure-induced chemistry opens the possibility of synthesizing new energetic materials."